Ed Wojtaszek’s photographs embody a style that is a rarity in today’s landscape: playfulness. In certain photographs, we see immediately a unique ability to serve as a guide, a narrator, an unseen director. 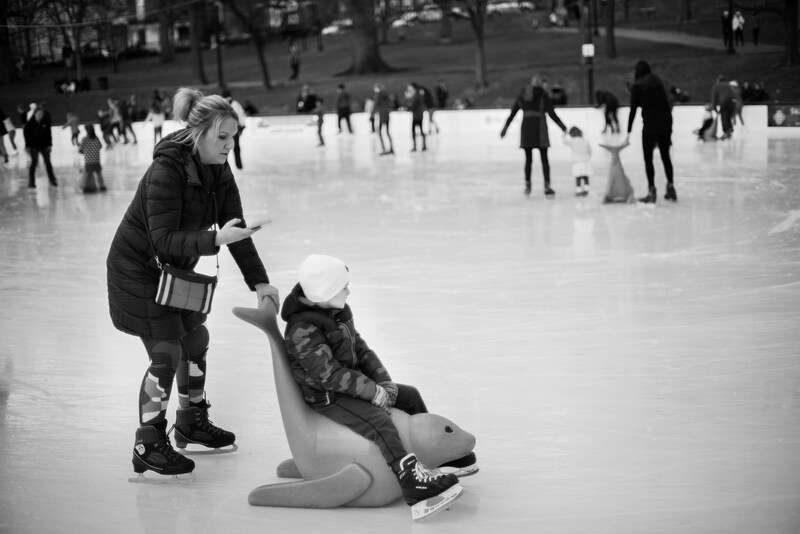 One photograph in particular, of those featured here, embodies this sense to me: “ice skating – lol,” which features a woman (presumably a mother) pushing a young child who is riding on a plastic seal; she does this while texting on her cell phone. 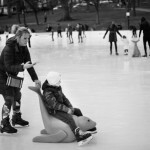 The child’s face is a picture of resigned boredom, as he stares at the ice in front of him–a gaze enhanced by Wojtaszek’s framing of the photo, with our foreground subjects off to the left, engaged in their plodding movement. In the background we see a different story, families and couples gliding around and laughing at their day out. Yet this image is captured in such a playful style, without stern judgement or brooding–the viewer can’t help but smile and think more about A Christmas Story rather than some Updikean family drama, that other photographers may easily succumb to. It is this ability to frame a scene with a sense of playfulness and embodiment the modern human experience that allows Wojtaszek to succeed in another style, removed from humor but rooted in empathy; an empathy used to great effect in a series of photographs capturing images of people at work. 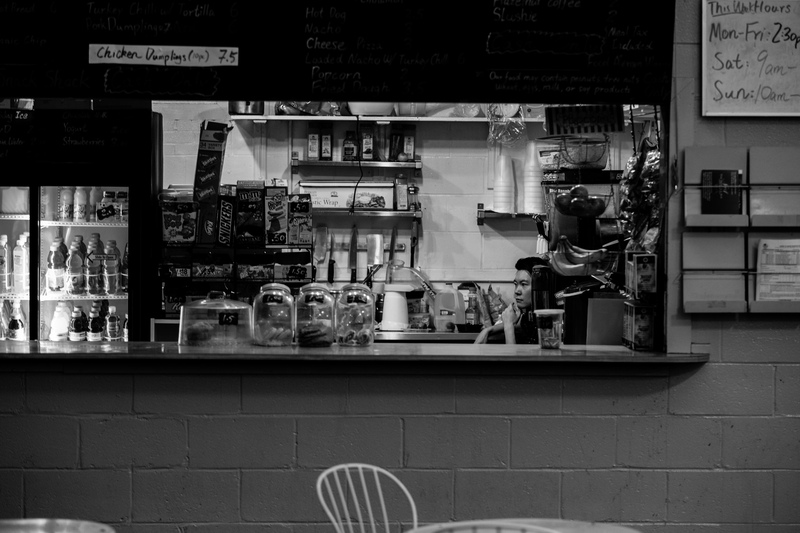 In the photograph, “Alone with His Thoughts,” we see a young worker behind a counter by himself, possibly in a train terminal. One arm hangs loosely over the back of his chair, as his other hand floats lost in thought by his chin, almost as if he became so lost in his thoughts he forgot to rest it on his chin. A diagnol movement takes me from his hands, to a cord hanging loosely above his head in the middle of the shelves above him, and finally to a taped-on menu item reading “Chicken Dumplings (10pc) 7.5” at the top of the photograph. I’ve been interested in photography for a long time, but I have a mathematics background and had a career In software engineering. Going way back, I suppose my interest in photography began when my grandmother gave me an Ansco Readyflash camera as a gift. As an artist, I feel that I haven’t had the time to earn that title. I pursued my career as an engineer for a very long time until I retired and had the time and resources to pursue photography. When I began my transition to street photography, Thomas Leuthard provided some insight and guidance through his writing and photography. Since then, I have discovered Lou Jones, a Boston photographer, and Richard Sandler who photographed the streets of New York for many years. If anything, the sense of humor in some of my images may reflect the work of cartoonist Bernard Kliban. One of my favorite things is to attend an event such as a protest, a show, or a convention to watch the people and to take photographs. Although I always try to have something in mind when I capture an image, most of the time it doesn’t work out and most get deleted. Of those that remain, I try to keep them as raw and natural as possible with minimal editing, except for the conversion to black and white. There is a message in each image and it can vary from humor to deeper emotions that require introspection and careful examination. To me, the impact of that messaging is what makes a good street image. I have eclectic tastes in literature that range from Kurt Vonnegut to Zane Grey. When I read, I prefer classics because I don’t read that much and I don’t want to waste my time on pop literature. For example, two of my favorite reads were Tale of Two Cities and Lord Jim. That said, I couldn’t resist The Island of Dr. Moreau. There are a few street photographers that I follow, including Thomas Leuthard, Richard Sandler, Adger Cowans, and others. I like to study their work and their evolution to understand the art. The one thing that I avoid is emulating their style; I’m trying to develop my own. Their work is a model for things that are possible and can be captured on the street. What is the role of community and gallery showings to your growth as an artist? My Internet presence has not been an adequate outlet and the thing that is missing is critical review. 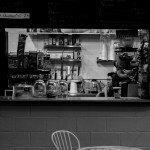 At this time I am reaching out and joining photography organizations as a way to get critical review of my work. Many organizations sponsor competitions that usually have juries of judges to provide critiques. After I successfully complete a few competitions I may try for a gallery showing, but I have none planned at the moment. I hike Boston regularly and haunt public gatherings looking for material. My goal is to cover each of the major areas in Boston, such as Southie and the North End. This summer will take me to the New England coast and places like Newburyport and Gloucester in search of subjects. I will never exhaust all of the material available for street photography around Boston.